At the luxurious 16 story Park Royal Apartments, adjacent to the President, a concierge introduces you to a refined atmosphere and apartments designed for elegant living. Just off the lobby is a beautiful party room available for special occasions. The large apartments with high ceilings offer the modern conveniences you have come to expect from luxury apartment homes while retaining the features and grandeur of their elegant past. In addition, many include balconies with spectacular views. 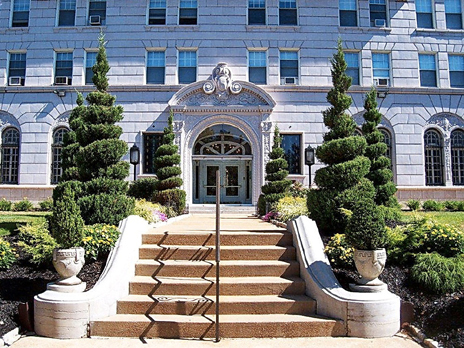 Built in 1930, this magnificent apartment building is located in the heart of the Central West End. Fine restaurants, cafes, art galleries, antique shops, places of worship, including the St. Louis Basilica, and medical services are within easy walking distance. One block away is the jewel of the St. Louis Park system, 1,300-acre Forest Park. Forest Park contains the St. Louis Zoo, Art and History Museums, Science Center, Municipal Opera Theatre, as well as golf courses, bike, nature and jogging trails and other recreational facilities. Downtown St. Louis, Lambert International Airport, Missouri Botanical Gardens, Washington University, St. Louis University and other college institutions as well as the central business district of Clayton are easily accessible via Metro Link or other forms of public transportation.